I love making refreshing meal salads in the summer and here in Houston it seems to be summer most of the time! For the poppy seed vinaigrette I’m using Aged White Balsamic Vinegar from Spicewood Food Company and can be ordered on-line at Spicewood. Regular White Balsamic Vinegar you find in stores will not work with this recipe, because it is very tangy and the one I am using has sweetness to it. The dressing itself can be saved and used in several salads. Just make sure to take it out of the fridge for about 30 minutes and shake it up or whisk because all the ingredients will have separated. Serves 1, adjust the ingredient amounts to accommodate the number of people serving. Make the dressing by whisking all ingredients and set aside. Bake the salmon for about 10 minutes in a preheated oven at 400 degrees. Don’t over cook because it will be tough. About 5 minutes before the fish comes out drizzle with the balsamic vinegar. 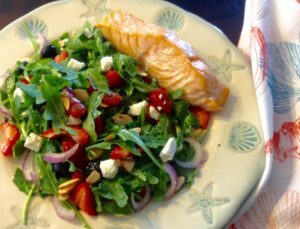 While fish is baking, make salad and toss with dressing. When fish is done top it on the salad or place beside it as I did and enjoy!